Bangla Adhunik Saras Kobita free ebook pdf file. 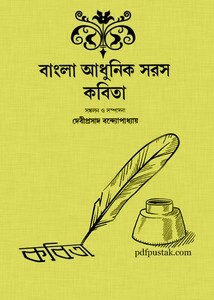 'Bangla Adhunik Saras Kobita' is a collection of funny poems book which edited by Debiprasad Bandyopadhyay. There are a lot collection of Adhunik Saras Kobita in this book. The book had 330 pages with 9.5 mb pdf size. All these poems are written by Various prominent poet as Ishwar Chandra Gupta, Pyarichand Mitra, Rupchand Das, Ramnarayan Tarkoratna, Madushudan Dutta, Rangalal Bandyopadhyay,Dinabandhu Mitra, Monomohan Basu, Bishnuram Chattopadhyay, Parimohan Kabiratna, Hemchandra Bandopadhyay, Bankim Chandra Chattopadhyay, Kaliprasanna Singha, Girish Chandra Ghosh, Jagabandhu Badra and many more.